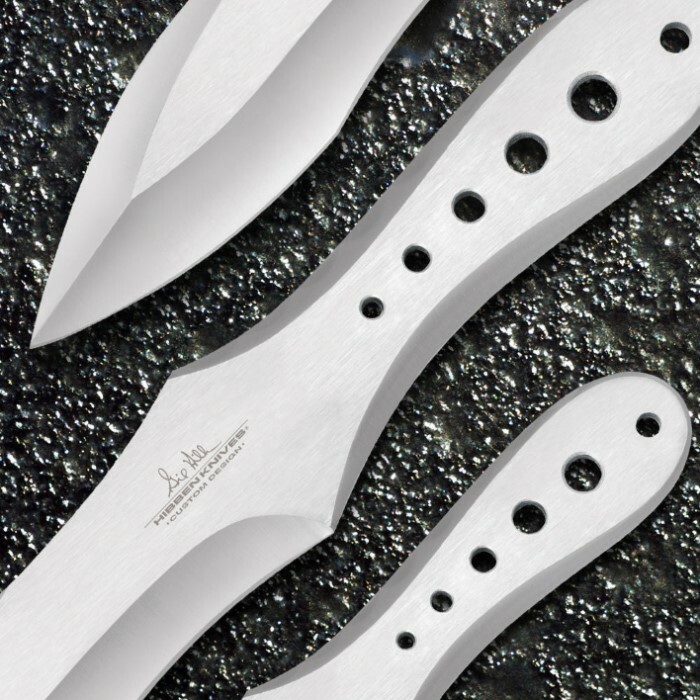 Take your next competiton or backyard knife-throwing session to the next level with these Next Generation designer throwing knives from Gil Hibben. 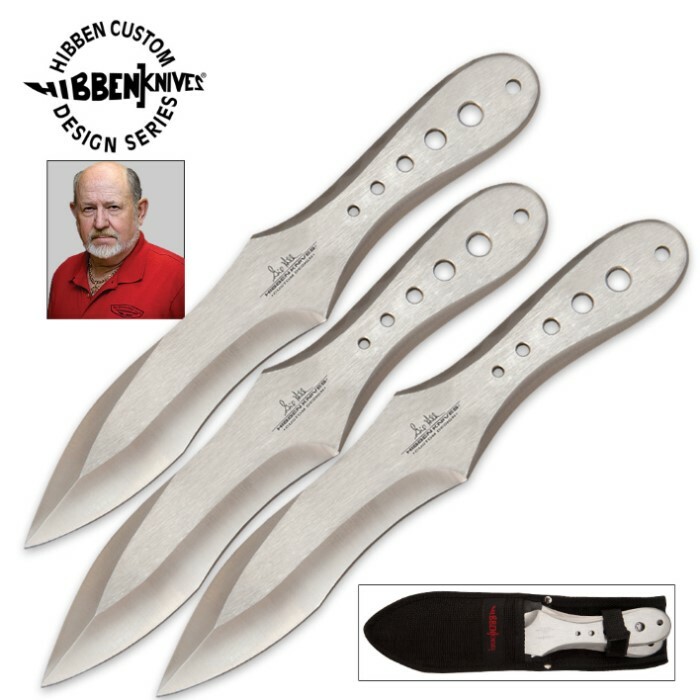 Each of these 11" throwing knives has a sharp edge and a piercing point for maximum target penetration. The open-hole cut-out designs in the handle also contribute to a professionally balanced weight proportion for increased accuracy. Includes a Hibben sheath. These aren't GP knives and they aren't combat daggers. These are flyers pure and simple. They are compact enough to carry 3 in a single sheath, but their huge heft gives them both impact and range. I no-spin these out to a staggering 25'. It shoots smooth and fast from the underhand position and spin throws to perfection because the handle makes consistant release almost automatic. There are more expensive knives out there but at $13/knife these are a delight to handle and are tough as nails. In 16k throws I lost one but haven't broken one. (They're just too thick to break.) These full figure gals are to put it simply, my all time favorite throwing knives. This is as much firepower as you can carry on your hip without buying a gun. Bought 1 set and started throwing, bought 2 more (gave 1 set to my son-in-law). Excellent balance and superior penetration. Any burrs or gouges are easily removed with a small 1" file. Highly recommended for anyone. Takes a little time to get used to the weight, but superior knife. I use 1 set just for practice and 1 set for a little friendly competition. Great set of throwers. These are my favorite. I have many sets of knives but these are superior. The weight at 11.7 ounces is excellent for good penetration and distance. The quality of the steel is also excellent with a good combination of hardness and flexibility. The balance is good and the handle contour is well designed. The blade design works well and is legal to carry in most places. 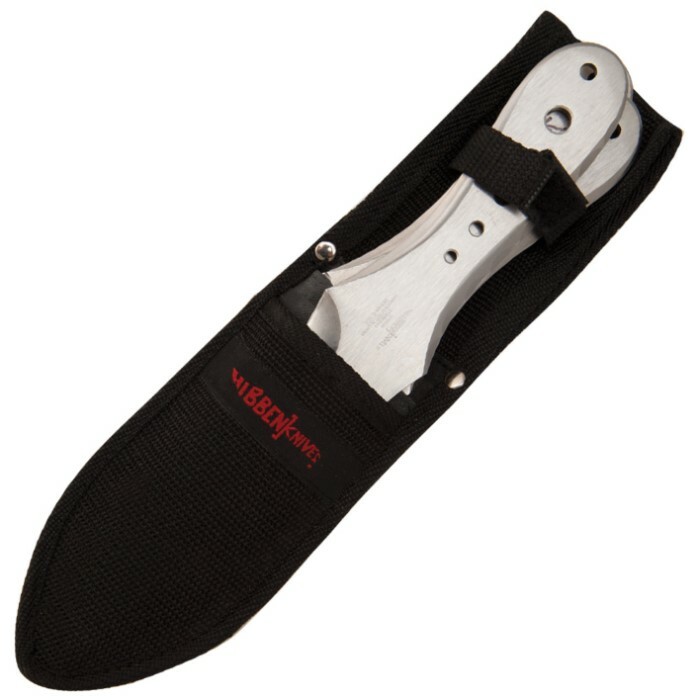 The sheath is ok but I would like to see one that gives more carry options. Overall this set is great. I've already got another set and I would definitely recommend them to a friend. Best Hibben throwers since the pro-thrower 1, which sadly they do not make anymore. Great weight and balance. Awesome. AWESOME LOOK and they fly EXCELLENT. I recommend these to everyone.